Item is a composite photograph of the Dalhousie University Faculty of Law class of 1935. 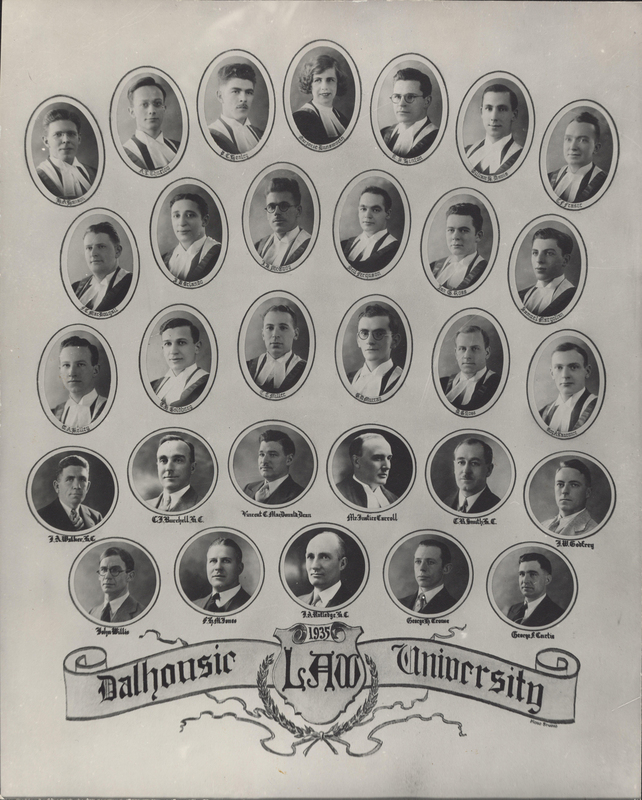 The photograph consists of portraits of H. A. Hanson; A. L. Thurlow; P. C. Henley; Marjorie Dunsworth; R. S. Hinton; William B. Davis; C. F. Fraser; F. C. MacDougall; J. D. Orlando; J. B. McCoog; Neil Ferguson; Ian G. Ross; Samuel Margolian; W. A. Kelley; E. H. Goldberg; T. T. Miller; G. D. Murray; G. D. Ross; Roy A. Laurence; J. A. Walker; C. J. Burchell; Vincent C. MacDonald (Dean); Mr. Justice Carroll; C. R. Smith; J. W. Godfrey; John Willis; F. H. M. Jones; J. A. Rutledge; George H. Crouse; and George F. Curtis arranged in five rows. Photograph is slightly worn around the edges.